The following Champagne cocktail recipes offer delicious ways to celebrate any special occasion. Although premium Champagnes are always favored, you can often use a less expensive brand when you are mixing it with other flavorful ingredients. Soak a sugar cube in Angostura bitters in the bottom of a Champagne flute. Slowly fill the glass with Champagne. Wait a moment for the flavors to mingle, and then enjoy. The Champagne Normande is a delightful treat that is based on the classic Champagne cocktail. A bit of Calvados adds another dimension to the flavor. Soak a sugar cube and some Angostura bitters in a Champagne flute. Add 1 teaspoon Calvados (French apple brandy). Slowly fill the rest of the flute with Champagne. This Kir Royale recipe couldn't be simpler. The liqueur adds a bit of color and a luscious hint of black currant flavor. Add a splash of créme de cassis to a Champagne glass. Fill the glass slowly with Champagne. The Mimosa is a favorite breakfast or brunch cocktail, but who says you can't drink it anytime you want? Pour 2 ounces of fresh orange juice into a glass. Slowly add about 4 ounces of your favorite Champagne. Garnish the glass with an orange slice. The Bellini tastes like a touch of heaven in a glass. It takes a little more effort to mix, but it's well worth the work. Add 2 ounces of peach nectar. Add 1 teaspoon of freshly squeezed lemon juice. Add 1 ounce of your favorite peach schnapps. Fill the rest of the glass with chilled Champagne. If you've never tried a Pernod Fizz before, now's the time. The Pernod imparts a lovely licorice/anise flavor to the cocktail. Add 3 ounces of Pernod to a glass. Top off the glass with chilled Champagne. Champagne and strawberries are an unbeatable combination. Once you've tasted this cocktail, you may never drink Champagne by itself again. Add 3/4 of an ounce of Creme de Fraise des Bois to a Champagne flute. Top it off with chilled Champagne. If you love the taste of passion fruit, you simply have to give this cocktail a try. Pour 1 1/2 ounces passion fruit purée to a Champagne glass. Add 1 teaspoon of simple syrup. Fill the glass with your favorite Champagne. Garnish with a star fruit. This recipe adds a nice touch of citrus flavor to your Champagne. The blue coloring comes from the liqueur used. Pour 1/2 ounce of blue curacao into a Champagne glass. Pour your favorite Champagne directly over the liqueur. A Champagne martini is delightfully decadent. It's the perfect cocktail for a special celebration. Fill a Champagne glass 1/3 full of Cointreau or your favorite orange liqueur. Fill the other 2/3 of the glass with Champagne. Garnish with a a twist of orange peel. 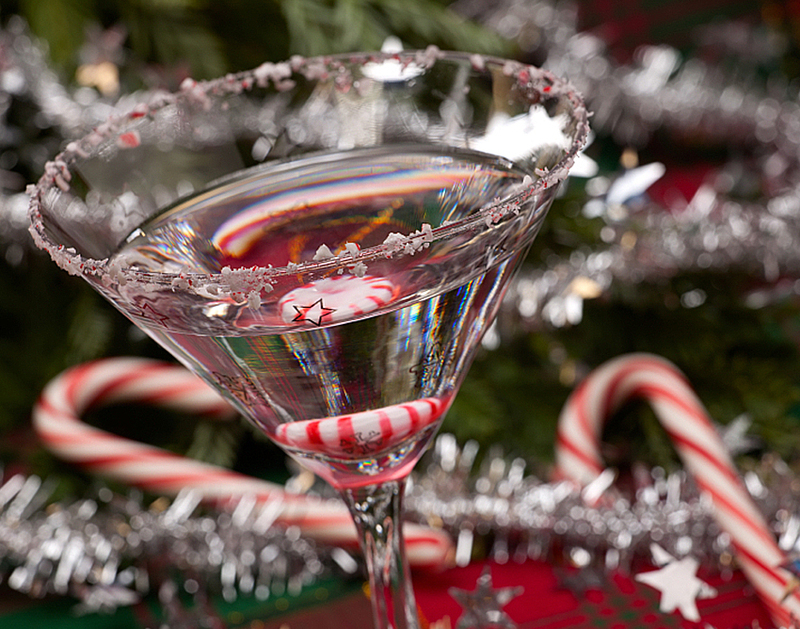 The extra alcohol in a Champagne Fizz gives this drink an extra kick, so keep that in mind as you indulge. This drink also requires a few more ingredients than most other Champagne cocktails. Combine the gin, lemon, and sugar in a shaker half-filled with ice and shake. Strain the contents of the shaker into a Champagne glass. Add 3 ounces chilled Champagne and drink. Cool mint combined with Champagne is simply sublime. If you've ever enjoyed a Mint Julep, you're bound to enjoy this cocktail. Combine 4 mint leaves with the sugar and a few drops of water, and muddle well. Add the bourbon, stir well, and strain into a Collins glass. Add ice cubes and fill the rest of the glass with Champagne. Garnish with remaining mint leaves and serve. The Champagne Cherry is probably one of the most delicious Champagne cocktails of all. The warm sweetness of cherry brandy is a lovely accent to all those bubbles! Pour 1/2 ounce of brandy into a chilled Champagne flute. Fill the glass the rest of the way with Champagne. Top with a Maraschino cherry and serve. Brandy and triple sec put an unusual spin on this Champagne cocktail. Pour the brandy and triple sec into a large wine glass. Fill the remainder of the glass with Champagne. One taste of this cocktail and you'll know how it got its name. It tastes like sunshine in a glass! Place 1 teaspoon of sugar in a chilled Champagne flute with the bitters. Stir in the lemon zest and serve. Keep in mind that when you're serving Champagne cocktails, it's good to also provide your guests with some appetizers to nibble on as they enjoy their drinks. That way no one becomes too tipsy to drive home after the party is over.